Last October I was able to go on the Syfy Digital Press Tour. The highlight of the event, for me, was getting to go on the set of Warehouse 13 and meet the cast. Here are some pics from around the Warehouse! I had to create slideshows when Flickr messed with the photo settings. Each of the cards below the artifacts has something unique to say about each item. Some of them are quite clever. Sorry that the quality isn’t better. Half of them (the better ones) were taken with my iPhone. And here I am in and around the office. And lastly, here are some shots of the boarding house. So Cool! Color me jealous. 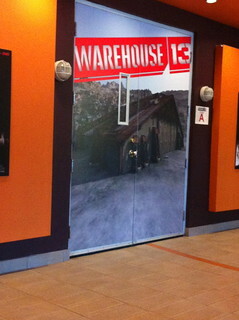 My family and I love watching WH13. It’s one of my favorite shows, so I was kind of in a daze! Great pix. Looks like a really cool set. Just wondering, can you expand on the actual warehouse part of the set? How many isles do they have built? Does it seem like they have a mechanism for changing the isles / stock for different episodes? (super curious.) Thanks for posting this! Thanks, Eric! 🙂 It was a lot of fun! Woot! I agree!! Jealous!! Thanks so much for posting! 🙂 Love the characters and artifacts. Kay – It’s amazing how much time/detail they put into each artifact.. even when they don’t end up on the show!